In every ocean, sharks are highly sought out... By one another and by the human race for their meat and for their valuable fin, often used in cuisine and trading. It is estimated that 100 million of these large fish-like animals die each year and at this rate, it could place lasting detrimental effects on our marine ecosystem. Across the pond in the United Kingdom, a group of individuals are uniting together to collect data on this species with hopes of creating animal protection acts. All across the globe individuals strive to achieve compassionate work and we at The Pollination Project provide seed grants to get their ideas off the ground. This week we fund seven projects that remind us that sharks are people too and that music holds the power to unite communities together. Please help us in recognizing our seven recent recipients! Ngwa Elvis Tangie, Reducing Post Harvest Lost and Increasing Food Security, Buea, Cameroon. Push trucks, operated with ones hands, empower women in maximizing their harvest, thus improving food security, income and life expectancy. Louise Ruddell, Citizen Shark Science Program, Marshfield, South Gloucestershire, United Kingdom. Data collection on the Elasmobranch species enhances studies, with the hope of generating policies and protections for sharks and rays. Desh Deepak Dwivedi and Kirti Krishan, Project Ibtida, New Delhi, India. An online marketplace aims to support grassroots organizations working in underserved communities in product design and marketing. Elizabeth H. Wu, Rhythm for All!, Cincinnati, Ohio, USA. People of all ages come together in a safe and welcoming space to spread love through music. Ngalim Franklin Njaiwo, Agribusiness for Schools, Bamenda, Cameroon. 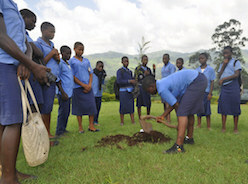 High school students are exposed to agriculture as a business through hands-on trainings in harvesting and compost. Bridget Saffold and Terrance Hollingsworth, Cedar Valley Focus on Diabetes, Waterloo, Iowa, USA. Healthcare professionals share recent findings and best practices on diabetes with the intent to organize community-wide initiatives. S. Meena and N. Venkatesan Natesan, Prevention of Malnutrition and Enhancement of Family Income through Gardening, Salem, India. Tribal women are trained in planting, cultivating and harvesting vegetable to aid in nutrition and economic income. Do you or someone you know have a project in mind to help bring compassionate justice to all things across the globe? We accept grant applications every day of the year! We are humbled learning about others' visions and what they are doing to spread peace and sustainability... One seed grant at a time.